When Jual Oram, Union tribal affairs minister, wrote to Odisha Chief Minister Naveen Patnaik earlier this year, he fanned a simmering controversy. In a letter dated February 23, Oram protested a new forest management scheme launched by the Odisha government. The Ama Jangal Yojana (AJY) or My Forest Scheme, implemented in 2015, empowers nearly 5,000 forest protection committees to manage forests. But Oram reiterated that gram sabhas were central to decision-making on matters related to community forest resources, and not the forest protection committees formed under AJY. As the nodal implementing agency for the Forest Rights Act (FRA), 2006, the Union Ministry of Tribal Affairs (MoTA) was concerned that AJY provisions were in conflict with the provisions of FRA. Activists agree, saying that state governments are setting up parallel structures to circumvent FRA and reinforce the authority of the forest department. The Scheduled Tribes and Other Traditional Forest Dwellers (Recognition of Forest Rights) Act, 2006, or FRA, was the first law to enable tribal communities to claim rights over forest lands on which they were traditionally dependent. It recognised their community rights over common property resources and the right to regenerate forest produce for their own use. But activists say that by reintroducing the forest department in the management of forest resources, schemes like AJY ensure that control over non-timber forest products (NTFP) remains with the department. Even as MoTA opposes Odisha, it has maintained a stoic silence over similar developments in Maharashtra and Madhya Pradesh, especially after facing heat from within the Union government. The tussle over forests is not likely to be resolved anytime soon, with the tribal welfare wing of the Rashtriya Swayamsevak Sangh (RSS) speaking out against BJP governments in the two states. Over the past two years, attempts to dilute FRA have become more blatant (see ‘Undermining forest rights’). 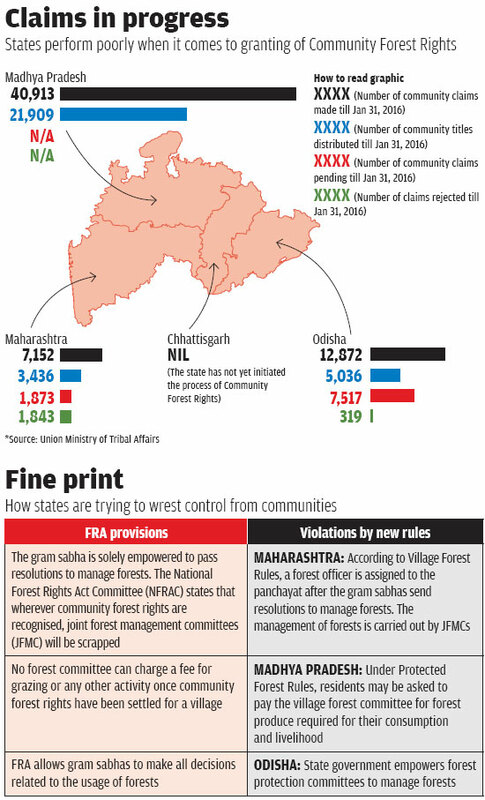 On May 13, 2014, Maharashtra invoked a largely forgotten provision of the Indian Forest Act, 1927, and notified the Maharashtra Village Forest Rules, 2014, without consulting MoTA. Village Forest Rules (VFR) enable the state government to extend the management and collection of forest produce to gram sabhas for protected and reserved forests. At the time, the Prithviraj Chavan-led government had said the move would help improve the forest cover of the state. Since then, 67 villages in Maharashtra have been given village forest rights. July 2009 | Centre scuttles attempt by Andhra Pradesh to grant community forest rights (CFR) to joint forest management committees (JFMC). January 2014 | Odisha launches Ama Jangal Yojana, a scheme to be implemented by its forest department on the lines of JFMC. May 2014 | Maharashtra notifies Village Forest Rules (VFR), 2014, empowering forest officers to advise on management of forest produce. August 2014 - May 2015 | Ministry of Tribal Affairs (MoTA) opposes VFR on several occasions, stating that it violates provisions of FRA. June 2015 | Madhya Pradesh notifies Protected Forest Rules, 2015, with the provision to charge village residents for forest produce. November 2015 | MoTA does a U-turn on Maharashtra and withdraws opposition. December 2015 | MoTA skips Madhya Pradesh and writes to Odisha government, protesting the Ama Jangal Yojana (AJY). But VFR seems to erode the empowering character of FRA (see ‘Fine print’). The new rules require the creation of a Van Vyavsthapan Samiti or joint forest management committee (JFMC) with a forest officer as member-technical. This officer, considered equivalent to the secretary of the panchayat, can advise the committee on matters relating to extraction and management of forest produce. The ownership of all harvested products remains with the forest department. Under FRA, however, decisions about forest produce are made by the gram sabha. Maharashtra is not the only state to seek recourse to the Indian Forest Act, 1927, to dilute FRA provisions. Madhya Pradesh used Section 32 of this colonial era legislation, which allows states to make rules for protected forests. Accordingly, the state enforced Protected Forest Rules (PFR) in June 2015, giving district collectors the power to attach a protected forest to any village. The Gram Van Samiti (village forest committee) constituted under these rules can, with the approval of the government, share any produce from the attached forest with any public or private company developing that forest. The rules also allow district and forest authorities to charge village residents for timber and fuel wood extracted for consumption and livelihood. The rules place significant powers in the hands of forest officers who can specify the areas from which such produce is to be obtained each year. 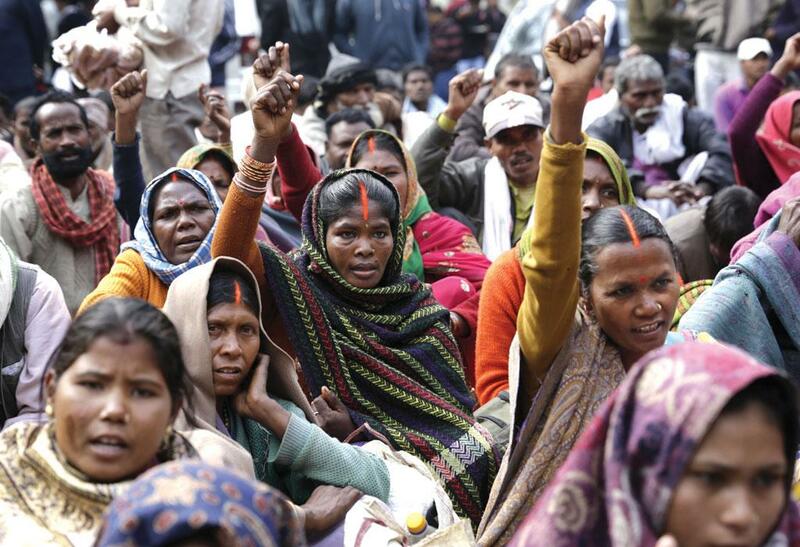 Chhattisgarh, on its part, set a dangerous precedent. On January 8, 2016, the state cancelled the Community Forest Rights allotted to tribals of Ghatbarra village in Surguja district. The state government claimed that village residents were using their rights to oppose mining in coal blocks outside the forest compartments allotted to them. But activists term the move as a clear violation of FRA as there is no provision for the cancellation of rights once recognised under the Act. However, forest rights activists say that with these schemes, the government wants the forest department to become the arbiter for forest resources. “Most of these changes have happened in states which are rich in minerals and where communities’ claims over forests are yet to be settled,” adds Shankar Gopalakrishnan of Campaign for Survival and Dignity, a non-profit working on forest rights. The progress of CFR claims in all four states is dismal. Not only were more than half of all community claims in Odisha pending until January 31, 2016, Chhattisgarh had not initiated the CFR process until then. Also, the number of rejected claims is high in Maharashtra (see ‘Claims in progress’). MoTA had opposed Maharashtra’s VFR on several occasions. But Union ministers Prakash Javadekar and Nitin Gadkari wrote to Oram, asking him to stop opposing the rules. Finally, on November 27, 2015, the tribal affairs ministry did a U-turn, stating that the overlapping provisions of VFR and FRA must be “harmoniously construed”, and withdrew its opposition. Three months later, Oram renewed his opposition to dilution of FRA, but wrote a letter only to the Odisha state government. Meanwhile, a motley crew has emerged to support forest management structures outside of FRA. Maharashtra’s VFR found support in land rights and anti-corruption activist Anna Hazare, whose village Ralegan Siddhi in Ahmednagar district is considered a model for sustainable development. Hazare wrote to Congress President Sonia Gandhi on January 26, 2016, asking her not to oppose VFR. He stated that his village would benefit immensely from VFR as it would give them access to substantial fodder from the forest. In Kumbhwaghol village of Amravati district in Maharashtra, a non-profit called Khoj worked with the forest department to implement VFR. Khoj coordinator Purnima Upadhyay tells Down To Earth that VFR has enabled village residents—the 50-odd Korku tribal families who had migrated from Madhya Pradesh in the late 1990s—to regenerate their own forests and sell timber. According to Upadhyay, since the Korku families did not have any records to prove their occupancy, they were not eligible for community forest rights under FRA. “Many other villages around the Melghat region do not qualify to get rights under FRA or PESA,” she says. Hiralal disagrees. He says FRA does not insist on evidence of occupancy in the form of records. The Act states that any member of a Scheduled Tribe who has been cultivating forest land as of December 13, 2005, is eligible to get rights. Korku tribal families were cultivating land in Kumbhwaghol well before this date. When Pawar met Maharashtra Chief Minister Devendra Fadnavis in February this year, he was told the state would not make laws that impact forest dwellers and adivasis. But there has been no move to withdraw these rules so far. With states making their own version of VFR, and MoTA standing by, activists fear dilution of FRA will turn into the proverbial juggernaut.